It was a surprise to me when, recently, I mentioned Craig Claiborne to a knowledgeable friend and he did not recognize the name. In the sixties and seventies, Claiborne dominated the Manhattan food scene and had a nationwide and international influence as restaurant critic and food editor of the New York Times. Quiet and retiring, he was a powerhouse who wrote two dozen books and fathered restaurant criticism as we know it today. In those years, I produced Claiborne’s appearances on the Today program and occasionally accompanied him when he reviewed restaurants. On one memorable occasion in the mid-sixties, I worked with him as he gave sushi its first major showcase on television. I thought I knew the man. How wrong I was. A stunning new biography, The Man Who Changed The Way We Eat, portrays Claiborne’s contribution to gastronomy, in the palaces of haute cuisine and in the kitchens of cooks, great and humble. Author Thomas McNamee celebrates the mild mannered Southern gentleman who propelled the food revolution of the last century and we learn almost more than some might care to know about his troubled private life. McNamee, who also gave us Alice Waters and Chez Panisse, traces Claiborne’s culinary career from his childhood in the kitchen of a renowned Mississippi Delta boarding house where his mother, Miss Kathleen, served the hush puppies and country ham of the region, but also offered sophisticated Creole cuisine which she had learned in New Orleans. He traces another food influence, Claiborne’s navy stint in World War Two, service under fire on the cruiser Augusta in the Mediterranean and eight months based in Morocco and Algeria where he discovered French bistro cooking along with the tagines and spices of North Africa. After military service, Claiborne studied classical French cuisine and hospitality at the famed Swiss hotel school in Lausanne and returned to the States after two years to begin a campaign that would take him to the New York Times. He worked as a publicist—unhappily-, tended bar and was a receptionist at Gourmet, writing and editing without a byline. He also wrote freelance and his articles brought him in 1957 to the attention of the editor of the Times’ women’s pages, who took a chance on an unseasoned writer, but not before passing him on to Turner Catledge, her managing editor. Catledge, like Claiborne, had attended Mississippi State College and that, Claiborne noted in a memoir, helped clinch the deal. But nothing happened accidentally with Claiborne. He knew that he’d have to interview with the tough, but folksy editor, and came in ready to play the ‘ol’ boy’ routine with Catledge. The two Mississippians palavered Delta fashion; reminiscing about school days down south and Claiborne was on the first step to inciting a food revolution. Once on staff, Claiborne slogged his way through assignments, most not related to restaurant reviews. Cannily, when he did review restaurants, he invited senior editors and their wives to join him; on the company, of course. His goal was to make them court him and he dreamed up pleasurable assignments to make research enjoyable. He avoided restaurant reviews as much as possible because there were so few good ones in an age of canned, frozen and prepared foods, and he hated going to bad ones. His breakthrough came in 1959 with an historic article headlined “Elegance of cuisine is on wane in America,” damming the poor quality of the nation’s restaurants, and hoping for help from the Culinary Institute of America, only recently founded in New Haven and later to move to its current home in upstate New York. Restaurateurs protested, the article made headlines across the nation and shook up the entire food world. 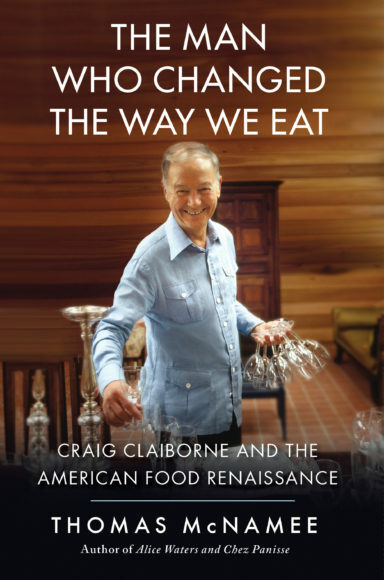 Claiborne became the prophet of the American food revolution, and he suddenly had the power and authority he had sought. In 1962, he began rating restaurants, one to three stars, later four, a system rapidly emulated by other newspapers whose editors scrambled to discover their own ‘Claiborne’ and turn hackneyed women’s pages into money making ventures with reports on local cuisine. Soon after his headline making attack on the American food scene, he asked the Times for permission to publish a cookbook under the New York Times logo. Astonishingly, management gave him full rights to a work to be called The New York Times Cook Book. Neither party realized how big a deal it was. First published in 1962, and revised frequently, it sold millions of copies—enriching Claiborne well beyond his newspaper salary—and continues to sell strongly to this day, along with the many other books Claiborne wrote. McNamee tells of Claiborne’s many successes, but he also reveals the dark side. Claiborne’s homosexuality at a time when it was largely masked propelled him into concealed,back door affairs; often in dangerous places, and brought him into years of psychiatric ministration. Unsettled, unhappy, Claiborne resigned from the Times in May, 1971. Three years later, after a failed venture into newsletter publishing, he returned to the Times as food editor, presiding over critics such as John Hess (unhappily), and more successfully with Mimi Sheraton, Bryan Miller, and John Canaday. In the early eighties, drinking to excess, taking drugs, writing less and less often and, reprimanded frequently by Times management, his longtime friendship with Pierre Franey and his family ruptured, a longtime love dead, Claiborne’s life spiraled downward. For the last six years before his death in January, 2000, Claiborne was in and out of hospitals and rehabilitation programs. He suffered from a weakened heart, surgical woes, infection and a series of strokes and financial difficulties, despite the success of his many books. He became increasingly irritable and antagonized friends who tried to help. He died on January 22, 2000. There was no funeral service and no tombstone for Claiborne. Four years after his death, friends held a modest memorial service and hung a plaque honoring him at the French Culinary Institute in Manhattan. That plaque, and this book, are what exist to keep the memory alive of this man whose name was once so familiar to many.